Here we are, starting the first year where I have two children and my toddler has a sibling. I say this every month but I am so proud of how C has taken to E. They are as thick as thieves. No matter what E is doing whether it's playing on her playmat, sitting in her Snug having a nosey around or being held by someone, C is straight over to her wanting to join in. I know that he just can't wait for her to be big enough to play and they are already the best of friends. C is the only one who can get proper laughs out of her by making a fool of himself then when she laughs, the sound of it makes him laugh then they're in a fit of giggles at each other! 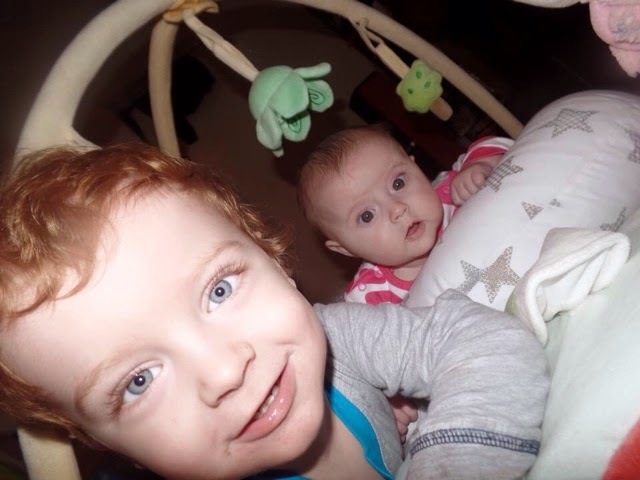 7 comments on "Siblings: January 2015"
What a lovely picture of your two! It sounds as though they are a perfect pair. Thank you so much for sharing them with us. Aww they're so gorgeous together - and yay for the start of a whole year of Siblings pictures - it's going to be wonderful!